SoulCollage® is an accessible collage process with practical applications that has a growing international community. It’s easy to learn and it’s inexpensive. Best of all, it inspires individual creativity and encourages good communication in families and groups. SoulCollage® is adaptable to many contexts and groups. Anyone can enjoy the multi-leveled, creative process. All you need is a good pair of scissors, pre-cut mat board cards, images you can find anywhere, and glue! When you have made some cards, you can consult them, asking important life questions and letting your cards speak your own intuitive wisdom back to you. SoulCollage® is fun to share with friends and in groups for personal enjoyment and self-discovery or to work with professionally, as a trained SoulCollage® Facilitator. Founder Seena B. 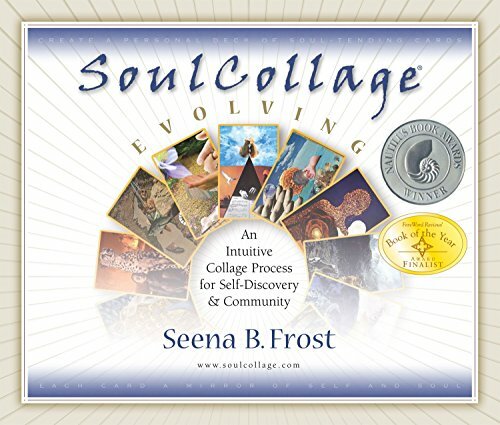 Frost s first book ignited a worldwide interest in SoulCollage®, which invites anyone to be creative and undertake an adventure of self discovery. All you need is a good pair of scissors, pre-cut mat board cards, images you can find anywhere, and glue! After you have made some cards, you can consult them, ask important life questions and let your cards speak your own intuitive wisdom back to you. Frost’s first book, SoulCollage®, now out of print, was a finalist for the Nautilus 2002 Book Awards for titles that contribute significantly to conscious living and positive social change. SoulCollage® has evolved into an international community of Facilitators and SoulCollagers enjoying and sharing this simple, yet profound process. SoulCollage® Evolving gives the basic instructions for how to make and do readings with SoulCollage® cards, and describes how individuals and groups are using this process with different age groups and in many socioeconomic, cultural, and religious contexts to discover their wisdom and change their world.